Mass tourism sometimes also has a beautiful face. 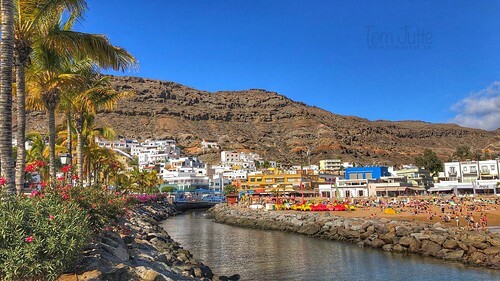 Between all the tourist villages on the south coast of Gran Canaria there is one village that is beautiful except for tourism: Puerto de Mogán. 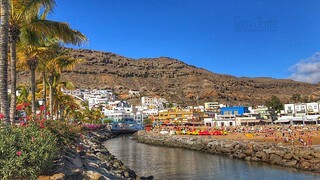 Puerto de Mogán is the westernmost resort of Costa Canaria; the tourist coastal area in the south of Gran Canaria. Although the name might suggest that the village is near Mogán, that is not the case. Mogán is located about eight kilometers inland. Puerto de Mogán consists of three parts. First, there is the beautiful golden sandy beach that is sheltered in a bay. Along the beach is a small boulevard with terraces and bars. Because of the sheltered location, the beach is ideal for families with children. There is hardly any wave and due to the southern location on Gran Canaria, Puerto de Mogán is very sunny. ☛ This is what we saw during our stay at Gran Canaria, Spain.